In December 2015 I traveled to Paris for the COP21 Climate Conference with the graduate students I was co-teaching in the "Becoming Pilot' seminar with Tomás Saraceno, Jol Thomson, Stefano Arrighi and Alexander Bouchner. Over the course of a few days we visited Tomas Saraceno's Aerocene exhibition at the Grand Palais and presented in a symposium on the Aerocene at the Palais de Tokyo. We aided in a Museo Aero Solar workshop and invented a secret handshake to alert for Greenwashing. We did ethnographic work in the COP21 Solutions fair and made new friends on the train by interviewing them about climate politics. Outdoor morning exercise - the Mycelium. Photograph by Jol Thomson. This semester at IAK institute we are teaching a series of undergraduate workshops around the theme of "Becoming Pilot". Inspired by Tomas Saraceno's project the Aerocene, and his aerosolar sculpture launches around the world, we are each developing a course based on one chapter of the FAA Balloon Piloting Manual. My chapter, Weather Theory, involves sensing air, atmosphere, turbulence and weather conditions for launching an aerostatic vehicle. Students are experimenting with various techniques and technologies for sensing environments. The primary practical exercise this semester is "One Cubit Meter of Busch". Students have demarcated one cubic meter of space in the Uhlandbusch around the Institute where each week they will sense, observe, record, think, move and experiment. Below are some images from the most recent series of experiments involving making air and atmosphere explicit in these spaces. One Cubic Meter of Busch + Smoke. Photo by Jol Thomson. The students of the Becoming Aerosolar graduate seminar (co-taught by Tomás Saraceno, Jol Thomson and myself) presented their work in the exhibition of Tomás Saraceno at 21er Haus, Vienna. They designed a manual, tested cut-down mechanisms, made aerosolar postcards, wrote texts, presented in a round table symposium, worked in motion, danced, and launched aerosolar sculptures at sunrise. Thank you to 21er Haus, especially Mario Codognato, Mario Kojetinsky and Julia Hartmann; Jessie Hofinger, Phillip Dreyer and Mathias Pelli at TU Braunschweig; Funk und Computer Zentrum Hohenschonausen, Sven Steudte and Thomas Krahn; and Adrian Krell, Daniel Schulz, Kotryna Slapsinkaite and Stefano Arrighi, all of whom made this excursion, exhibition and many aerosolar launches possible! A Manual for Becoming Aerosolar. Rewriting the Drake Equation for Aerosolar intelligence. Becoming Aerosolar Exhibition Catalogue, in which I have a piece with Derek McCormack and Bronislaw Szerszynski. Launching an aerosolar sculpture in the morning. Together with Tomás Saraceno and Jol Thomson I am teaching a graduate seminar called Becoming Aerosolar. This semester we had two weekend-long aerosolar sculpture workshops at the IAK, during which we constructed several sculptures of different weights, materials and geometries; programmed microcontrollers for tracking systems; invented aerosolar maps; assembled an aerosolar instruction manual; and revised contemporary air traffic law to accommodate lighter-than-air flights. The students will present their work in a new exhibition by Tomás Saraceno at the 21er Haus in Vienna, also called Becoming Aerosolar, opening June 21st. Around the opening there will also be an opening symposium where we will present our work alongside academics and artists like Nigel Clark, Derek McCormack, Sanford Kwinter, Helga Elsner-Torres, Etienne Turpin and Bronislaw Szerszynski. During the exhibition in Vienna viewers will have the opportunity to bring their own materials to construct aerosolar sculptures, and rent bikes with propellers to inflate them. Follow IAKinstitute on Twitter for live updates; tweet using the hashtag #becomingaerosolar. I have a new commentary article out in the March 2015 issue of Dialogues of Human Geography, in response to Pete Adey's "Air's affinities: geopolitics, chemical affect and the force of the elemental". Other commentators were Derek McCormack, Anna Fiegenbaum and Anja Kanngieser, Marijn Nieuwenhuis, and Philip E Steinberg. Abstract: It is a definition of elemental air as more than human, wholly ungraspable, and even monstrous, which enlivens Adey’s method of ‘affinitive listening’ to the elemental. The difference between air, as it has been lately addressed, and the element of air is that the latter precedes and exceeds the specific alchemical compositions of air masses, and is not reducible to the descriptions and metaphors with which we attempt to ‘grasp’ air and atmosphere. This commentary experiments with the concept of elemental air and, in particular, the method of affinitive listening, with the help of an atmospheric thing. I propose the Montgolfier infrared balloon as a device that sounds and senses air, generating materials and space times that render explicit, and also ungraspable, the atmospheric envelope around Earth. The final exhibition for the Becoming Solar seminar took place inside a breathing "aero solar" structure, inspired by the geometries of spores and pollens. The students exhibited their research and artworks inside the structure, printed to its membrane, or resonating through the space. The ventilation and breathability of the form was an integral part of the exhibition and concept. In presentations, the students spoke of starting a movement of nomadic schools in Mexico, the chemical structure of PVC and diamond crystals, the psychology of floating in space, and air pirates, among many other things. Tomás Saraceno gave comments and direction for future research; and Alan Prohm and Ivana Franke were "guest critics". On November 21st, 2014 the Institute fur Architekturebezogene Kunst at TU Braunschweig hosted a "solar sculpture workshop" with undergraduate and graduate-level students in the "Becoming Solar" seminar, co-taught by Tomás Saraceno, Jol Thomson and myself. After hearing a brilliant lecture by Dr. Bronislaw Szerszynski, we teamed up to design and construct four "solar sculptures" - air-filled objects that can fly by harnessing the energy of the sun. The workshop continued into the night and there was even a dance party inside two of the solar sculptures (named 'Frankie' and 'Charlie'). We frequently checked with weather report for news of sunshine. The following morning we transported the solar sculptures to a field near Wolfsbüttel, Germany and inflated them with the wind. With the help of radio-amateur and telecommunications specialist Sven Steudte we attached a pre-programmed GPS tracking device and camera to Charlie. At around 8:30am we tried to launch: Charlie drifted across a field, made buoyant by air warmed with the sun. Then a large tear opened in the back of the sculpture and the sculpture sailed to the ground. This was the first sculpture we lifted off the ground with solar energy alone - it was a great success! Museo Aero Solar at Les Abattoirs, Toulouse. Photo by Studio Saraceno. On October 11th and 12th I participated in a colloquium at Les Abattoirs, Toulouse on the notion of designing a "monument" to the Anthropocene. The colloquium centred around a series of proposals for "monuments" from artists like Tomás Saraceno, Adam Lowe, Amy Balkin and Yesenia Thibault-Picazo. Organized and curated by Bruno Latour and Bronislaw Szerszynski, the colloquium and exhibition included lectures by Christophe Bonneuil, Pierre Chabard, John Palmesino, Ann-Sofi Ronnskög and Emilie Hache. There were also a series of interventions between artists and thinkers: Adam Lowe and Féderique Ai-Touati, Bronislaw Szerszynski and Tomás Saraceno, and Nigel Clark and Iain Baxter, among others. Tomás Saraceno's "monument" took the form of a partially-inflated lighter-than-air sculpture called Museo Aero Solar. The Museo is a long-term project involving many participants and communities around the world, and it actively questions our relationship to the thin but highly resilient material of plastic bags. 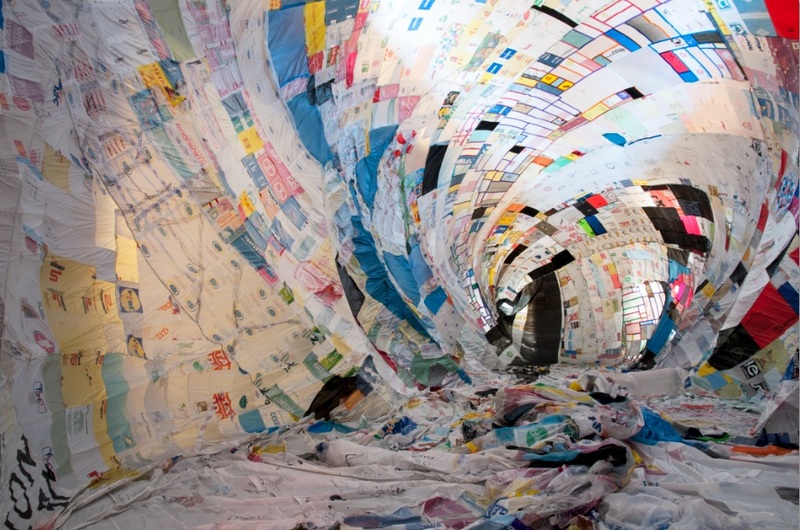 Participants bring their reused plastic bags, cut them into rectangular shapes, and join them together onto a surface that is later inflated by the sun (sometimes with the help of a small ventilator). The project is visually stunning and its aesthetic force lies in the fact that it proposes a different way of existing in and sensing the elements: without the use of burners, fossil fuels or gas, solar energy is transmuted into hot air which generates lift, causing the multi-colored Museo to rise. Also in the exhibition was a room of prototypes for other solar lighter-than-air vehicles, and the presentation of a publication I edited on the same subject for Studio Tomás Saraceno. The publication included contributions from Nigel Clark, Myra Hird, Derek McCormack, Kathryn Yusoff, Etienne Turpin, Nick Srnicek, MIT's Center for Art, Science and Technology, Pete Adey, Robert Poole, and Olafur Eliasson, among others. Publication in the exhibition room of Tomás Saraceno. Me, Bronislaw Szerszynksi and Bruno Latour in the Museo Aero Solar. What might it mean to become solar? To feel and sense the force of the sun? If hunter gatherer societies monopolized land area for energy, and in the industrial revolution the burning of fossil fuels decoupled energy use from territory, freeing human societies from Earth's surface, what metabolic regime might come next, freeing us from the surface of the Earth a second time? Tomas Saraceno and I presented our ideas for a Solar Society at the world's first Climate Engineering conference in Berlin on August 19th. We spoke of closed biosphere research, cloud typologies, lightweight materials, natural highways in the stratosphere, and solar balloons. In the context of the Anthropocene, our aim was to ask much deeper questions about human societies' relations with the climate system, the Earth and the Sun. We tried to explode the debate in climate engineering - to provoke what climate engineering is and can be. A video of our presentation can be found here! 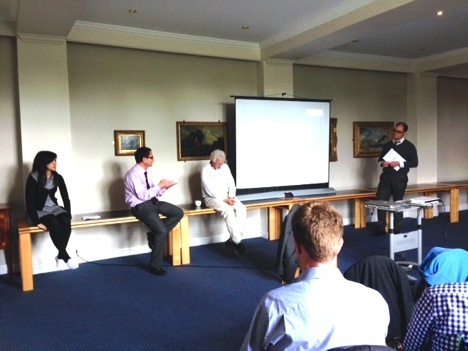 Together with Dr. Peter Wynn Kirby, I co-organized a symposium on 'Trespassing in Fieldwork,' held at St. Hilda's College, Oxford on June 3rd. Participants from across the social sciences spoke of their experiences conducting covert ethnography, exploring hidden and off-limits sites, and managing sensitive situations and data. Sponsored by the Technological Natures Research Cluster, the symposium investigated “trespass” in its ethical, methodological and social dimensions, hosting presentations grouped into three at once distinct and overlapping areas: trespassing territory, trespassing the social, and penetrating extra-legal zones. However, as the day progressed, what emerged was a common commitment to “trespassing” as an attunement to the practices of various marginal and/or subversive communities and subcultures, as well as concern over its institutional and legal consequences. The symposium drew the attention of academics and journalists alike, and was featured in an article in Times Higher Education. Peter and I have also written a summary of the day for the Tech Natures website, which you can access here. Ai Wei Wei; Stools, 2014. Is it a coincidence that the Ai Weiwei exhibition at Martin Gropius-Bau in Berlin, opening weeks after the Forensis exhibition at HKW, is called Evidence? The exhibition is Ai Weiwei's largest in Germany to date, including works like Stools (pictured above) made especially for the Berlin museum. In it there are also topographic marble sculptures of the Diaoyu islands, metal rods harvested from school buildings ravaged by the Sichuan earthquake in 2008, and an identical replica of Weiwei's holding cell in Chinese prison, where he was kept for 81 days under constant surveillance. The gathering of evidence, and the bringing of such evidence to light in the public domain, is the theme of the exhibition. But the same might be said of Forensis, curated by Anselm Franke at HKW, and including "case files" from the research conducted by architects like Paulo Tavares, Nabile Ahmed and Adrian Lahoud. If Weiwei's personal narrative is woven directly into the exhibition at Martin Gropius-Bau, the narratives presented at HKW are told by secondary sources and researchers, and are somewhat hidden in data, models and satellite imagery. Still, both exhibitions are not oriented to make the invisible visible, but more accurately, to make visible that which is already visible (but repressed or ignored). A better way of putting it is that both Forensis and Evidence render explicit the stories, materialities and aesthetics of human rights violations rippling from heated points around the world. A sketch I made of the anthropcoene. The "Anthropocene" is the name earth scientists and geologists have proposed to denote a new geologic and planetary epoch characterized by the force and intensity of human actions on Earth. This week I have been reading a brilliant book called Architecture in the Anthropocene edited by Heather Davis and Etienne Turpin. Last weekend I visited the Forensis exhibition (curated by Anselm Franke) and the Anthropocene Observatory at Haus der Kulturen der Welt in Berlin. A few thoughts have been surfacing in the process. First is the idea proposed by Eyal Weizman that the term "forensis" not only connotes the process of crime scene investigation, but also the "forum" and its constitution. In the exhibition, forensis is understood not just a technique, but a research strategy and an attempt to bridge critique and action. It is a willingness to intervene in the world, rather than just produce written or visual reflections. The ethos of "forensic architecture" is something that might (should!) be considered in a discipline like geography, which at the moment is rippling with work on territory, volume and verticality, as well as the implications of climate thresholds. In an interview involving John Palmesino and Anne-Sofi Ronnskog (from Architecture in the Anthropocene), John quotes visual critic Irit Rogoff professing that a theorist is "one who undoes." I like this idea of theory "unhinging reference points" and promoting a wild, "feral state" of ideas. It reminds one of the very real, messy even haphazard role of theory in various contexts; it also complicates the common understanding of theory as abstract, overly elegant and clean. From a Deleuzian perspective, a theory or philosophy is as "real" and textured as a scientific practice, with its own "plane" of striation, micro-movements and rhythm. As Nigel Clark has argued, restraint may not be the best ways to act in the Anthropocene, since the human species will need to react to and become-with a rapidly changing environment. Perhaps we need more generous and creative theories (and theorists), ones which compel lively, a little bit messy, and even exuberant action in the very uncertain future. In December 2013 I made a pilgrimage to Christo's latest artwork, "Big Air Package" at the Gasometer Oberhausen in Oberhausen, Germany. The work was only the latest in a series of "air package" executed by Christo and his late partner Jean-Claude since the 1960s. The installation is monumental. It is constructed of silver, polyurethane fabric within a gas tower that is 90 meters high, and visitors can enter into the base to be immersed in the soft glowing white atmosphere. RT @R_Trotta: @szerszynski @sashacakes @jolthomson Using neutrinos to detect dark matter in the Sun: exploit an almost invisible particle to see another!